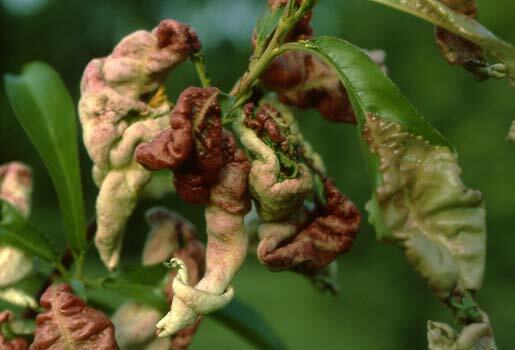 Leaf curl is a springtime disease that occurs on peach, nectarine, and related ornamental plants. The disease, though not a problem every spring, can be severe during cool, wet springs that follow mild winters. The leaf curl fungus damages peach trees by causing an early leaf drop. This weakens the trees, making them more susceptible to other diseases and to winter injury. Weakened trees also will produce fewer fruit the following season. Yield may be further reduced when blossoms and young fruit become diseased and drop. Figure 1. Typical symptoms of peach leaf curl. Note the malformation of infected tissues. Symptoms of leaf curl appear in the spring. Developing leaves become severely distorted (thickened and puckered), and have a reddish or purple cast. Later, as spores form on the leaf surface, the leaves become powdery gray in color. Shortly after this, the leaves turn yellow or brown and drop. There is no secondary spread of this disease from leaves infected in the spring to new leaves produced later in the growing season. Once infected leaves drop, no further symptoms will appear during that growing season. Diseased twigs become swollen and stunted, and may have a slight golden cast. They usually produce curled leaves at their tips. Though rarely seen, flowers and fruit may also become diseased. They drop shortly after they are infected. 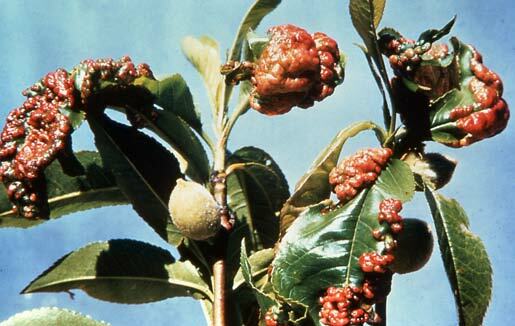 Diseased fruit has shiny, reddish, raised, warty spots. Peach leaf curl is caused by the fungus, Taphrina deformans. The fungus survives the winter as spores (conidia) on bark and buds. Infection occurs very early in the growing season. During cool, wet spring weather the conidia infect new leaves as they emerge from the buds. Host plant tissues are susceptible for only a short period. As the tissues mature they become resistant. The fungus produces another type of spore (ascospore) on the upper surface of the diseased leaves. During wet weather, ascospores produce additional conidia by budding. These conidia are carried to other parts of the tree by rain and wind, where they will overwinter until the next spring. Environment can limit leaf curl infection. This partially explains why the disease does not occur every year. Leaf curl is worse when the weather is cool and wet. Low temperatures are thought to retard maturation of leaf tissue, thus prolonging the time infection may occur. The fungus can penetrate young peach leaves readily at temperatures between 50 and 70 degrees F, but only weakly below 45 degrees F. Rain is necessary for infection. Figure 2. Peach leaf curl. Leaf curl is not difficult to control. Since the fungus survives the winter on the surface of twigs and buds, a single fungicide spray, thoroughly covering the entire tree, will provide control. If leaf curl does result in significant defoliation in the spring, the fruit on affected trees should be thinned to compensate for the loss of leaves. Over-cropping the tree will weaken it and make it more susceptible to winter injury. For the most current spray recommendations, commercial growers are referred to Bulletin 506, Midwest Fruit Pest Management Guide, and backyard growers are referred to Bulletin 780, Controlling Diseases and Insects in Home Fruit Plantings. These publications can be obtained from your county Extension office or the CFAES Publications online bookstore at estore.osu-extension.org.